Specific airway resistance (sRaw), or its reciprocal specific airway conductance (sGaw), was first introduced over 35 years ago as a way to gather information on airflow resistance in conscious subjects during quiet spontaneous breathing. This parameter is derived from the double-chamber plethysmography (DCP) technique, which separately captures the subject’s nasal and thoracic flow signals over time. In addition to information on flow, information on the alveolar pressure changes is typically needed to characterise resistance to airflow within the respiratory system. This latter signal is however not easy to record in a conscious subject. In the DCP technique, information on airflow resistance across the entire airway tree is extracted from the comparison of nasal and thoracic flow waveforms. 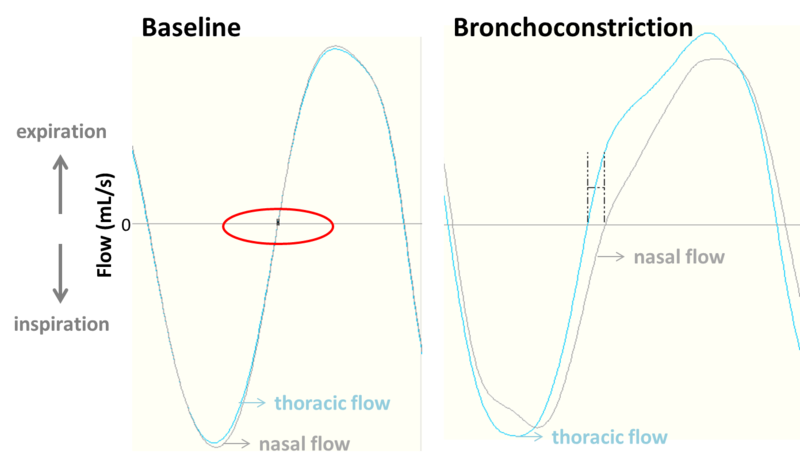 In this approach, while both waveforms are generally similar and can be superimposed under baseline conditions, the presence of an increased resistance, such as during bronchoconstriction, causes the nasal signal to be delayed relative to the thoracic one, thus inducing a measurable time interval that was shown to be proportional to sRaw. The point on the waveform at which to characterize the time delay between nasal and thoracic flow signals is important. During inspiration, the air entering the airways gets heated and humidified and, as a result, expands within the lungs. This process, known as gas conditioning, has significant implications in the determination of the time delay mainly because it is particularly important during inspiration, which is also when peak changes in resistance occur. However, gas conditioning is proportional to flow. Therefore, its impact is minimal at the end of inspiration where flow is zero (see red circle in the picture). This specific point on the flow profile can thus be employed for sRaw determination, specifically because of it allows for a separation between the contributing gas conditioning and resistive components. It is worth mentioning that this specific point does not however correspond to the point of peak resistance changes, which would happen earlier during inspiration, and therefore represents a compromise as highlighted by the phenotyping uncertainty principle. While sRaw captures information on airflow resistance, it is important to realize that it is not a true measurement of airway resistance. Its units are cmH2O.s while typical airway resistance units would be cmH2O.s/mL. sRaw rather denotes work of breathing as it is defined by the product of airway resistance and the lung volume at the end of inspiration, the functional residual capacity or FRC. Since both factors can influence the outcome of sRaw and that there is an inverse relationship between them, best practice would be to complement measurements of sRaw with direct measurements of both upper and lower airway resistance. This would not only provide more insight in interpreting the results but also a refined and comprehensive assessment leading to a deeper understanding. The flexiVent system offers detailed lung function measurements which can prove helpful in identifying the response site within the lower airway segment while also providing direct upper airway resistance measurements. Both airway segments can also be assessed almost simultaneously in the same subject using a specialized configuration of the system. Please contact us to find out more on preclinical lung function measurement techniques and their outcomes. Pennock et al. 1979. A noninvasive technique for measurement of changes in specific airway resistance. J Appl Physiol 46: 399-406. Bates JH, Irvin CG. 2003. Measuring lung function in mice: the phenotyping uncertainty principle. J Appl Physiol 94:1297-306.